Today is Bastille Day — seems right to post something about the “French Colonists” of La Réunion. One of the leaders of the French and Swiss immigrants who settled briefly — and ultimately unsuccessfully — on the western banks of the Trinity in the mid-1850s was François Jean Cantegral, “President” of the colony and one of the Directors of the Franco-American Company. Cantegral arrived in Texas about 1855 with hopes of establishing a successful utopian community, but the land, the climate, and the lack of experienced farmers in the group led to its fairly quick demise. 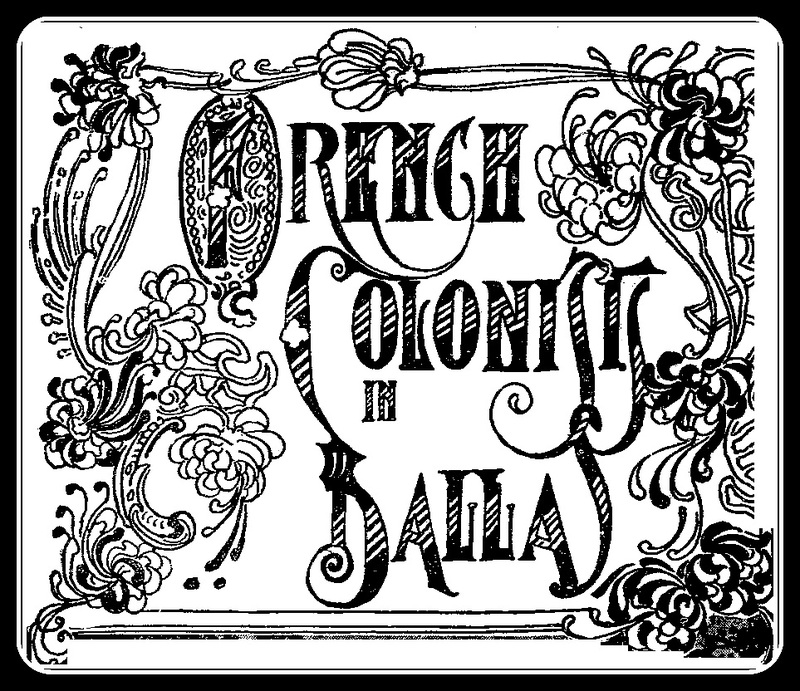 Some of the European colonists settled permanently in the young town of Dallas, some scattered to other parts of the United States, and several — including Monsieur Cantegral — returned to their homelands. Cantegral returned to Paris where, according to an 1876 article in the Dallas Herald, in a mission to participate in the reform and political liberation of France, he served three terms as an “alderman of Paris” and was elected to the French Chamber of Deputies, serving in the French Parliament. In 1877, Cantegral — who apparently had warm feelings toward Dallas and its citizens — sent to the city an early edition of a newly issued map of Paris. 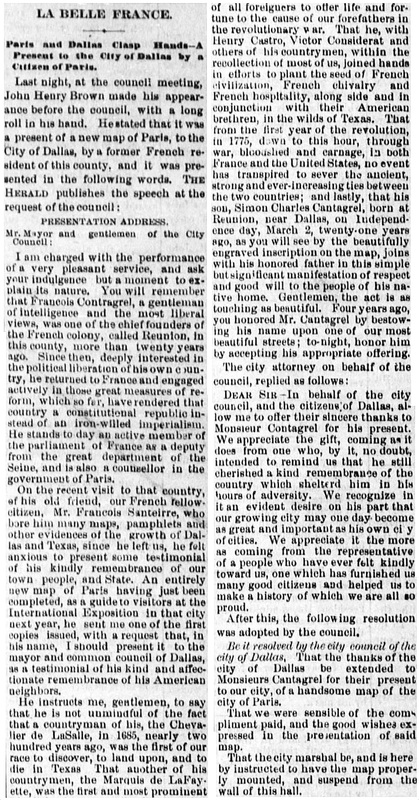 On its presentation before the mayor and the city council, it was noted that, in following in the footsteps of his fellow countrymen LaSalle and Lafayette, the members of the French Colony at Réunion “joined hands in efforts to plant the seed of French civilization, French chivalry and French hospitality, alongside and in conjunction with their American brethren in the wilds of Texas” (quoted in The Dallas Daily Herald, March 21, 1877 — see full article below). It was noted that while living in the colony, Cantegral’s son, Simon Charles Cantegral, was born on March 2, 1856 — Texas Independence Day. He seemed quite proud of that. The map was presented in the names of Cantegral père and Cantegral fils. I wonder if that Paris map given to the City of Dallas in March, 1877 is still somewhere in the city archives? Merci, François. Liberté, égalité, fraternité, from those of us back here in the wilds of Texas! Top image from The Dallas Morning News, April 26, 1903. The two articles are from the Texas Digital Newspaper collection of the University of North Texas, via their Portal to Texas History. The collection contains thousands of issues of the Dallas Herald (not to be confused with the 20th-century Dallas Times Herald); it’s hard to stop reading them because they are so unbelievably fascinating — set aside a few hours and browse the Herald collection (1855-1887) here. Three years ago a beautiful street in Dallas, that running east of Floyd street Church and west of the Baptist College, was named in his honor and will remain a perpetual memorial of him in this town. More on the La Reunion colony can be found in other Flashback Dallas posts here. Click articles to see larger images. Cantegral sure isn’t a “beautiful street” anymore. Wow, I always thought that Cantegral Street had something to do with calculus or something… thanks!